– CuriosityStream, the world's first ad-free, on-demand nonfiction streaming service, is available starting today on Amazon Prime's new add-on subscription service. CuriosityStream is a subscription-based service that delivers high-quality programming from the world's best documentary filmmakers. Starting at just $5.99 a month, Amazon Prime members may now sign up for CuriosityStream and enjoy access to 1000+ original and first-run documentaries about topics ranging from science and nature to history and the arts. CuriosityStream’s nonfiction library includes original series such as A CURIOUS WORLD, DESTINATION: PLUTO, CURIOUS MINDS and exclusive landmark series such as NEXT WORLD WITH MICHIO KAKU, WILD WEATHER WITH RICHARD HAMMOND, THE SECRETS OF QUANTUM PHYSICS, THE AGE OF HUBBLE, DESTINATION MARS, THE NANO REVOLUTION, INSIDE THE HUMAN BODY, ANCIENT WORLDS, VIKINGS and BEHIND THE ARTIST. CuriosityStream also produces exclusive, short-form documentaries, including MARS: THE JOURNEY, THE RISE & FALL OF T-REX, DARK SECRETS OF THE COSMOS and EXPLORING QUANTUM HISTORY WITH BRIAN GREENE. 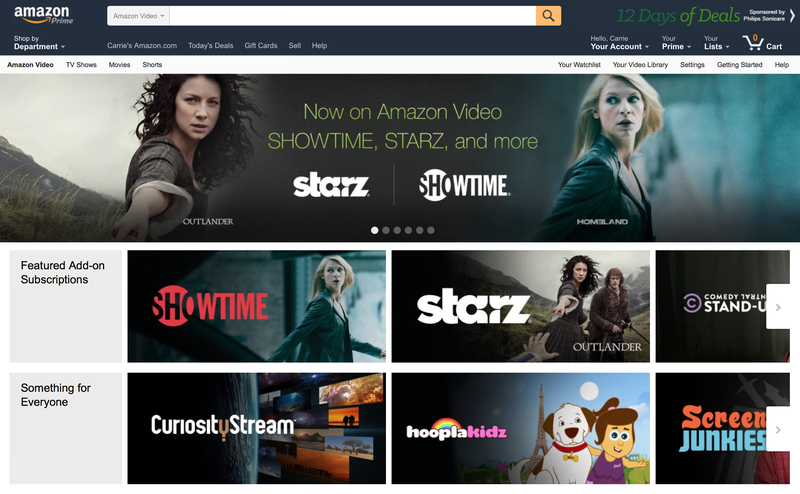 “Partnering with Amazon on their new SVOD delivery platform is an important milestone for our service by diversifying access options for new subscribers,” said CuriosityStream president Elizabeth Hendricks North. “Amazon Prime members may now sign up for their CuriosityStream access within the Amazon platform and enjoy over 500 hours of quality nonfiction documentaries that enrich, enlighten, enchant and thereby enable curious humans to better understand our world." Amazon-CuriosityStream subscriptions are only available to Amazon Prime members via an HD monthly subscription price of $5.99 and may be found here. Since Amazon Prime’s Add-On service will deliver CuriosityStream's media library directly to Amazon Prime members, these new Amazon-CuriosityStream subscriptions do not offer access to CuriosityStream's original service, which is delivered via multiple mobile apps, devices and laptops. CuriosityStream is the world's first ad-free subscription video on demand streaming service for nonfiction programming. Watch over 1,000 quality documentaries and series from the world's best filmmakers, anytime and anywhere. CuriosityStream membership is now available worldwide with pricing starting at just $2.99 a month for SD resolution streaming. The first 30 days are free for new subscribers. CuriosityStream also oversees production studio Curiosity Studios and hosts Curiosity Retreats, annual lifelong learning gatherings featuring fascinating lectures on the topic areas of science, technology, civilization and the human spirit. Sign up for the next Curiosity Retreat, October 2-7, 2016 by visiting CuriosityRetreats.com. Join CuriosityStream's community of the curious at www.curiositystream.com and on Twitter @CuriosityStream.